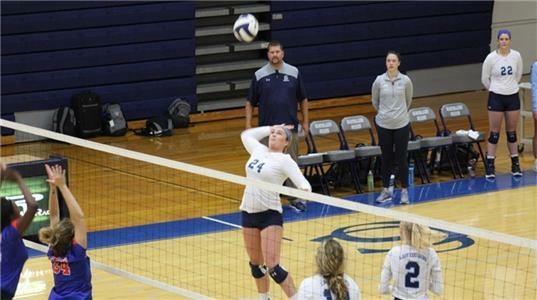 Cleveland State Community College's women's volleyball hosted a home match against Chattanooga State on Wednesday evening. Chattanooga State defeated the Lady Cougars three sets to one. The first set of the match went well for the Lady Cougars. They started out with an early 10-5 lead over the Lady Tigers and managed to consistently hold that lead the rest of the match. The Lady Tigers started to catch up but Caylea Duckett smacked a solid kill, giving the Lady Cougars a 15-13 lead. The end of the set was a back and forth affair as the two teams tied three different times. The Lady Cougars eventually came out with the first set win, by a score of 27-25. The next two sets were led by Chattanooga State as the Lady Cougars struggled to gain any momentum. Sets two and three went to the Lady Tigers by scores of 25-22 and 25-23. The Lady Cougars last lead in a set was the first set of the match, but they managed to find another lead in the final set, when they took the lead over Chattanooga State, 19-15. This quickly evaporated, however, as the Lady Tigers rolled on to a 25-21 victory in the fourth set. Sidney Killingsworth and Kayla Wimpee were the big guns at the net for the Lady Tigers with 16 kills apiece. Emily Redden added 24 assists and four digs. Cleveland State has now lost their last five matches and will need to reevaluate some areas as they prepare for their next matchup against Crown College on Monday, September 24th at 7:00 PM.